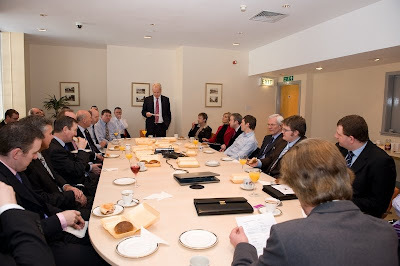 THE latest meeting of the Elite Ayrshire Business Circle took place at 8.30am on Friday 14 March 2008 in the board room of the Clydesdale Bank Financial Solutions Centre in Alloway Street, Ayr. 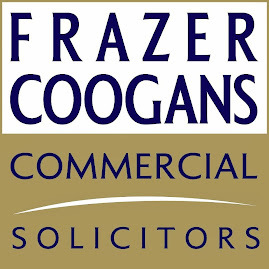 Guests at the meeting included John Scott, MSP for Ayr, South Ayrshire Council Provost Winifred Sloan and deputy leader Margaret Toner, Glasgow Prestwick Airport chief executive Mark Rodwell, and local newspaper Ayrshire Extra editor John Matthews. 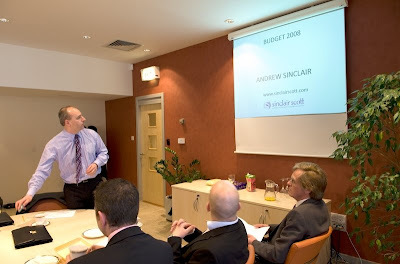 Members and guests heard an expert and entertaining analysis by Andrew Sinclair (pictured above) of Sinclair Scott Chartered Accountants about the implications both for individuals and for businesses of Chancellor of the Exchequer Alistair Darling’s first Budget, which had been presented to Parliament two days earlier on Wednesday 12 March 2008. Andrew’s presentation was followed by a comprehensive overview of likely future trends in interest rates, commodity prices and inflation given by Neil Wilson of the Clydesdale Bank’s Treasury Department. 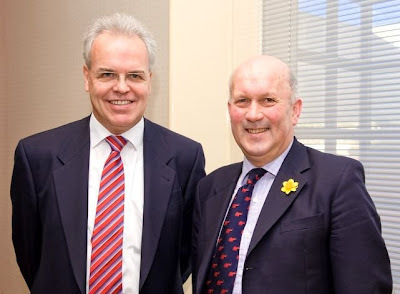 Elite Ayrshire Business Circle executive chairman Norman Geddes (above left) welcomes John Scott, MSP for Ayr. Norman Geddes with South Ayrshire Council Provost Winifred Sloan (above centre) and deputy leader Margaret Toner. 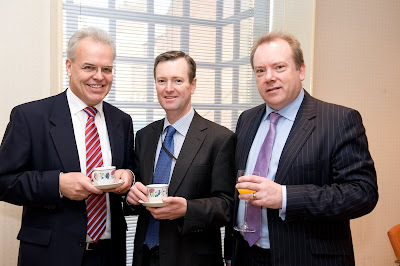 Norman Geddes with Glasgow Prestwick Airport chief executive Mark Rodwell (above centre) and Clydesdale Bank Financial Solutions Centre managing partner Willie Mackie. 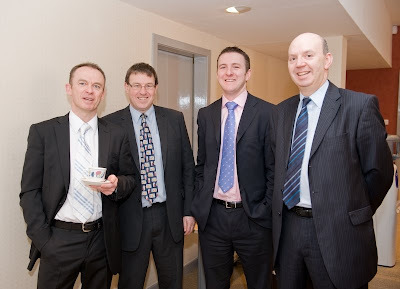 Elite Ayrshire Business Circle members (above, left to right) Stephen Wilkie, partner at Sinclair Scott Chartered Accountants; David Kennedy, senior partner at Clydesdale Bank Financial Solutions Centre, Ayr; Graeme Ferguson, director of Kestrel Press Ltd; and Ian Warnock, managing director of MacKay Corporate Insurance Brokers. 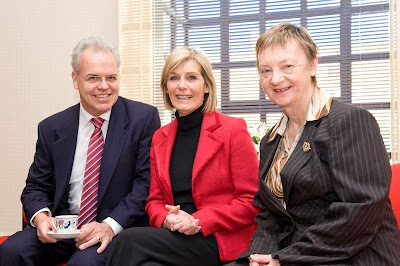 Pictured above, left to right: South Ayrshire Council Provost Winifred Sloan and deputy leader Margaret Toner with Ayrshire Extra editor John Matthews.